Description: OpenSS7 References SS7 Stack References. Note: Some of the information concerning the reference sources and lists of books in this section may be incomplete, incorrect, out of date, or inconsistent with a publisher or document broker's actual offerings. Please consult with your book or document dealer before making any decisions. Also note that lists in this section do not constitute an endorsement of any document source, book, product, or service. The authors of OpenSS7, their sponsors, agents and representatives will not take responsibility in it. Specifications of the SS7 protocol are provided at the international level by the International Telecommunications Union - Telephony Sector (ITU-T) in their Q.700 series recommendations. Many of the implementors guides and documents are publicly available without charge off of the ITU website, however, the ITU does charge for most of the primary specifications documents in the Q.700 series, and, therefore, you will not find them available on the OpenSS7 website. 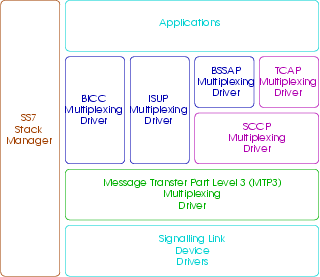 Of course, the ITU-T provides recommendations, specifications and standards for a large number of protocols including ISUP, TCAP, AIN, GSM, MAP, etc., which will be of interest to applications developer using OpenSS7, but only the MTP and SCCP portions of the specification directly impact the OpenSS7 stack and are the only recommendations listed above. ETSI documents are individually downloadable, free of charge, however, free of charge does not mean that I can post copies here for you. You will have to go register with ETSI and get your own documents from the ETSI Publications Download Area. Most ETSI documents at this level are really just modifications of the ITU-T documents and only contain changes from the ITU-T documents, rather than the complete text of the specification. It is very difficult to work with these modification documents without the original ITU-T Q.700 series recommendations to which the modifications apply. ETSI has a great number of technical specifications and standards on their website available for download. Many of these specifications have to do with ISUP, TCAP, AIN, GSM, MAP, etc., and are of interest to the OpenSS7 application developer. Because they do not directly relate to SS7 MTP or SCCP, they are not listed here. ANSI provides the standards specifications for the MTP and SCCP portions of the SS7 protocol for most of North America. Telcordia (formerly Bellcore) documents are based heavily on the ANSI documents. The ANSI documents themselves are based heavily upon the ITU-T documents. One source for ANSI documents is Global Engineering Documents . Some popular ANSI SS7 documents are as follows. Most of these documents carry a pretty hefty price tag (several hundred US dollars each). They are not made publicly available without charge. Telcordia has other specifications relating to ISUP, TCAP, AIN, MAP, etc. which are at the application level and which are not of direct interest to the OpenSS7 project. OpenSS7 applications will be interested in some of these documents. Please see the Telcordia website for more information.